Written on September 30, 2008 by Kevin. Written on September 26, 2008 by Rylan & Kaitlyn. We are one more week closer to when my Grandma and Grandpa come back home from Seattle. Kaitlyn and I have been working hard making artwork for them and we have our popular red beans and quinoa meal all planned out. We can't wait. This week has been full of trips to the library. We picked up a bunch of new movies to check out. Mom and dad like showing us some of the movies that they used to watch. The library has so many cool movies. Kaitlyn and I have had fun at the play tables. They have a bunch of puzzles and those bead toys. Kaitlyn still needs work but I have mastered them and they are a bunch of fun. Kaitlyn had a fun time standing on the table and dancing. She is really embarrassing sometimes but I still love her. The weather here has finally started to get a bit cooler. While it's not cool enough to go outside during the day, it's getting there. Kaitlyn and I can't wait to get outside and ride on our tricycles. They have been sitting and collecting dust. Kaitlyn got her tricycle for her birthday and it even has her name on a license plate. That is so cool. Earlier this week we head to the Phoenix CoyoteFest which is an event they have at the hockey arena for people to see the team practice. It was fun. Kaitlyn and I went down to the glass and were waving. A puck went flying over the glass and through the net. Dad tracked it down and got it for us. Its an official practice puck, yay! We got in there and found a seat, moments later one of the players hit the puck so hard at the glass that it broke! It was amazing. Our dad will certainly be getting some photos up next week. That's gonna wrap it up. Have a good weekend everyone. Written on September 24, 2008 by Kevin. Calling all Sesame Street fans. K'NEX has created a new series of Sesame Street themed building sets. A total of 7 sets will be available which include Elmo, Cookie Monster, Oscar, Ernie, Bert, Grover and Abby Cadabby. These appear to be great looking toys for a toddler that loves Sesame Street. They are designed for children 2+ and will retail for around $10.99. If your child is into blocks and piecing things together, this may be a good choice. While Kaitlyn and Rylan have not field tested this item, it certainly looks like they would have fun with it. Written on September 23, 2008 by Kevin. Each night as we are heading into bed ourselves, my wife and I check on the kids once more. We enjoy watching them as they sleep and are always curious about how they get into some positions. Kaitlyn is famous for getting all turned around while falling asleep. Rylan typically is tucked under his sheets but has been known to be sleeping in the bed next to Kaitlyn as well. No matter how they are laying, they of course look extremely sweet. After some difficult days of them just being terrible, it is nice to see them sleeping and quiet. Lately as we have been checking on them, Rylan has been waking up slightly. I have found the perfect solution though to keeping him happy and heading back to sleep. I tell him to dream about Disneyland of course. He immediately gets a smile on his face. I tell him to think about Mickey and Goofy and the Princesses. He says "And Pete.". I tell him to think about the corn dogs, the pizza and the rides. He tells me in the cutest sleepy voice. "and popcorn too! I want to try." For Rylan, there is nothing better than dreaming about Disneyland and all that it offers. He is just aching to get back. Throughout the day it is not uncommon to hear him say "Mommy. Go. To. Disneyland.". For now, he will have to keep it in his dreams. Written on September 22, 2008 by Kevin. He couldn't be happier with it. Written on September 19, 2008 by Rylan & Kaitlyn. Well the craft show last weekend went pretty well. My dad had to work the show doing whatever the coordinators asked him to do. We went to visit him and that was pretty exciting trying to find him. We didn't sell as many hair bows as we had wanted but it was still a decent show. My birthday is just under a month away. Mom and I have been preparing lately and trying to decide what theme to go with. I have chosen a Mario party! It's going to be awesome. Mom is going to make a cake safe for Kaitlyn and I think it's going to be Mario themed as well. I can't wait. Kaitlyn has been doing great with her coloring. I like to do my crafts while she colors. In fact, mom has been making things out of clay lately and while she does that I get to work with Playdoh. I like to try and make things like her. 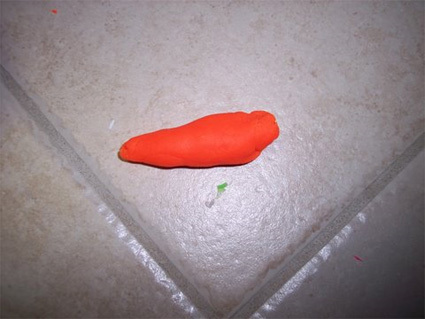 I made a carrot the other day. I think it turned out pretty well. Kaitlyn and I have been learning how to clean up lately. Mom gave us a bath the other day but before we could do that, we had to clean up our room. We both helped out mom and now the room looks great. I almost forgot what the carpet looked like. Ok, well it wasn't that bad but it definitely is nicer now. Kaitlyn is turning into such a big girl. She is learning so many new words now and this weekend I hear she will be having her car seat turned around. I'm a bit bummed though because now I can't look at her and pick on her. It will be a bit more difficult now but not impossible. I'll find a way. I think that's about it. Have a great weekend. Written on September 16, 2008 by Kevin. Written on September 12, 2008 by Rylan & Kaitlyn. Its crunch time for mom and dad. They are preparing for their first really big craft show. It's a full two days and they expecting a lot of people. We love going to the craft shows. It's all that I can talk about sometimes. Mom explained the other day that we do the craft shows so that we can go to Disneyland. Now I want to go to even more craft shows! This is the first show that we are not going to be hanging out at the table so it should be interesting. I predict a great show. Kaitlyn and I had our first sort of play date yesterday. It was the first time we had seen these kids so it took a bit of warm up but it was fun. We went over there because our mom had some business with there mom. They had so many toys. We didn't even know where to start. It was fun and I think we may go back soon. Kaitlyn has been acting up lately. In fact, just yesterday she decided to poop on my bed pillow. What was she thinking? On a good note though, she is a great artist. Well not with her poop but with crayons. She has been drawing pictures with me lately while mom and I work on crafts. She does a really good job. Oh ya, she also seems to have learn the word "broken". She said "broken" and handed my mom a balloon that she had around her wrist. It was broken because the knot had started coming undone. She's a smarty. As for me, I have been helping mom plan for my upcoming birthday party. I still am a bit undecided on what the theme will be but I am leaning towards a Buzz Lightyear party. To infinity and beyond! Oh one more thing. We have decided what we are going to be wearing for Halloween. I am going to be a green dinosaur and Kaitlyn is going to be a cute little witch. She even has a little hat to match. It's going to be super cute. We need to get back to doing crafts and drawings. Have a good weekend everyone. Written on September 11, 2008 by Kevin. Did you know that the Cabbage Patch Kids have been around for 25 years now? Well they have and they are now releasing for a limited time, the original Cabbage Patch Kids. Yes, the ones you had when you were a kid. When I learned that I was to receive one pre-release, I was pretty excited. Kaitlyn already has a Cabbage Patch Kid but to have one like the original would be neat. We received the box a few weeks ago and decided that we would hold it for her until Christmas. In the meanwhile, it's sitting on the floor upstairs. When she noticed the package the other day, she sat in front of it, touched it and said "Ohhhhhhhh". I think she is going to be excited this Christmas when she actually gets to open it. Check out the CPK anniversary site for more information. Written on September 9, 2008 by Kevin. If you have ever watched the remade Charlie and the Chocolate factory, you know that there are some very random funny quotes. I recently pointed the "I love grapes" quote out to Rylan the last time we watched the movie. He very quickly picked up on it and now even trys to mimic the old ladies voice. The other night during dinner, just randomly, Rylan began saying "I love grapes!". It definitely made dinner quite a bit more fun. He loves the laughing he gets out of us as he says it. Written on September 8, 2008 by Kevin. It was a few days before Christmas that we tried giving Kaitlyn her first bottle of formula. My wife didn't feel that Kaitlyn was getting enough milk from her so went with the formula to see how she would do with it. Being her first bottle, Kaitlyn had a bit of a time getting everything lined up and ready to be drank from. She covered herself in formula and then it happened. She had a serious reaction to the formula causing hives anywhere the milk had touched. She was crying and we knew we had to go to the emergency room. The drive over was pretty scary as we could tell that Kaitlyn was beginning to have a hard time breathing. The ER calmed down the situation and we learned from then on not to use milk based formula. After a bit further of nursing, we tried Kaitlyn on soy formula. She responded well to this and has been on the bottle pretty much ever since. It was very apparent that Kaitlyn was allergic to milk. We took her in for a full allergy test on Thursday to see exactly how severe her allergies may be. They did a test for 38 common allergies and she actually showed significant signs of being allergic to milk, eggs, peanuts and almonds. Even soy she showed a pretty high reaction to despite her drinking it everyday without noticeable issues. Now that she is getting older and is eating more of our normal dinners, we have needed to know exactly what she may be allergic to so this is very important information. Of course, grandparents and other family members need to know as well so they can help us keep those foods away from her. We were told that allergy testing is only about 60% accurate so there is still hope that she is in fact not allergic to some of those items or maybe even that she will grow out of them as she grows older. We are dedicated to making her life as easy as possible with these allergies. I know that many of the best foods have these items in them so we are looking for alternatives. She has been eating pizza with us lately minus the cheese. Both restaurants we have been to have been very accommodating. Let's hope most of them are. Written on September 5, 2008 by Rylan & Kaitlyn. Well the countdown has begun. Me and Kaitlyn are super excited because this week we learned that our grandpa and grandma that had gone up north this summer are going to be coming back in October. We are very anxious to see them because it seems like it has been forever. We have so many new things to show them. We can't wait. Well the most important thing that happened this week was that we all went to get Kaitlyn's allergies checked out. They did a test to see what she was allergic too. She did really well and giggled part of the time as they tested her. She was even caught dancing afterward so that's good. I, on the other hand, can't be expected to sit in a tiny office for 45mins without going nuts. The nurse tried to put in an Elmo movie and have us watch it. No thanks. My dad will talk more about her allergies next week. We headed out for pizza with grandma on Labor Day. That was super super fun hanging out with her. We got to play a whole bunch of games and Kaitlyn even got to participate. We both had a blast. Kaitlyn even got to try her first pizza. Dad had them make a special pizza with no cheese on it. She liked it a whole bunch but gosh it was messy. Dad will have to think that one out a bit further next time. Speaking of eating, we also headed out to our other grandma and grandpas house this last weekend for burgers. Grandpa sure can make a good burger. Oh do you remember those blocks that our mom and dad bought us? Those big cushy ones are so much fun to play with. Dad helps us set up a fort to play in and I like to build houses. The other day I made a circus and Kaitlyn was the circus clown. Mom thought that it was pretty darn funny. Well it's time that we get back to more important things. Have a good weekend everyone. Written on September 4, 2008 by Kevin. You never really know what is going to happen when you put your child to sleep in their own bed. Are they going wake up in the morning and trash the room? Maybe they will just lay there looking up at the ceiling thinking about all of the neat new things they will be doing that day. Luckily for us, when Kaitlyn was moved over to her own bed, she would wake up and just sit in bed. In fact, Rylan would just sit in his bed as well and they would just talk to one another. The occasional time to leave the bed was to grab a toy or book and then back to their beds they went. They did this all on their own. Now that Kaitlyn has been in her bed for a bit though she has decided to venture outwards. It began when my wife caught her running back from the window. When my wife asked her about it, Kaitlyn pointed to the window and said "Look it!". At least she was honest. Kaitlyn's new thing though is going to their bedroom door and knocking on it. Of course when you go check on them and she is standing behind the door, no matter how slow you open it she is bound to get pushed over which certainly doesn't make her happy. I am not certain where she learned to knock on the door but she does it very effectively. It can be heard throughout the house. Side note, Rylan loves to come up to us and knock on our legs. It may not be the most effective way to get our attention but it seems to work for him. Written on September 2, 2008 by Kevin. Many parents seem to have troubles weaning their child off of their wonderful pacifier. The item that is the center of every photo ever taken of the child. Like Rylan, we did not have any intention of giving Kaitlyn a pacifier at first. The time came though that it was the only thing that would soothe her so we dropped our rule and gave it to her. The fun began at that moment. You swap a crying baby for a needy baby. If you misplace that pacifier, expect hell to be paid. We returned home a few weeks ago and put the kids to bed. My wife asked me where Kaitlyn's pacifier was and I responded that I did not know. We both scoured the downstairs looking and looking but it was not to be found. We tentatively put Kaitlyn to sleep without her pacifier and prepared for a cry fest. We indeed did get a night of crying but as expected, the days went by and the crying subsided. It has now been a few weeks without the pacifier. We couldn't be happier. Trying to keep tabs on that pesky pacifier and make sure it doesn't hit the floor, I certainly do not miss. We have yet to find the pacifier after turning the house upside down. We have no intention of looking through the van for it. We do need to find it before Kaitlyn does however. I cannot imagine the look on her face if she finds it one day. The roller coaster of emotion when she found it and then when we took back away would be heart breaking for everyone.